Choose a nice apartment on airbnb, e.g. in East Village. Heaven‘s Hot Bagel. Nice hot bagels – as it says. Cornerstone Café. Good to start a day..
Sugar Café. Breakfast place and cafe. Atlas Café. Offering vegan breakfast. Clinton Street Baking Company. Great pancakes! Go early to avoid the queues. Luke‘s Lobster. Get their delicious lobster roll! Papillon. Bistro not far from Central Park in Midtown Manhattan. Buenos Aires Steakhouse. Argentinean restaurant in East Village. The Spotted Pig. Funny pub in West Village with their special Roquefort Burger. Bill‘s Bar and Burger. Good burgers on convenient locations as the Rockefeller Centre. Vanessa‘s Dumplings. The diner in Chinatown is all about dumplings and very affordable. Gemma. Italian restaurant with great atmosphere at the Bowery Hotel. Try the Truffled Polenta Fries. Lavagna. Italian trattoria in East Village. Gruppo thin Crust Pizza. Pizza for eat-in and take-out. Peter Luger. Great steakhouse in Brooklyn, their NY Restaurant even earned a Michelin star. Rockwood Music Hall. You can drink a Stella beer while listening to bands, sometimes concerts are for free. Ella Jazz Bar. Unfortunately closed but their friendly barkeeper recommended an American Whiskey: Bulleit Rye. Rare View. For drinks on their rooftop bar. The Bowery Hotel. They have a nice outdoor area and good drinks. Known sights worth passing by: bustling Times Square, the New York Library, the huge Central Park, the Flatiron Building and the famous Statue of Liberty. 9/11 Memorial. The water basins represent the footprints of the former Twin Towers. Get a view over Manhattan from the Rockefeller Center, Top of the Rock. This way you can see the Empire State Building. The Metropolitan Museum of Art features a great rooftop overlooking Central Park and very impressive collections from all over the world. The Guggenheim (closed on Thursdays) designed by famous architect Frank Lloyd Wright. New Museum with contemporary art and building designed by Japanese architects SANAA. Chelsea Market. Many small shops for fashion, accessories and food. Take a walk on the famous High Line Park and enjoy the view. Williamsburgh Fleemarket. Get a snack here as it offers loads of food stands and you have a beautiful view on Manhattan. 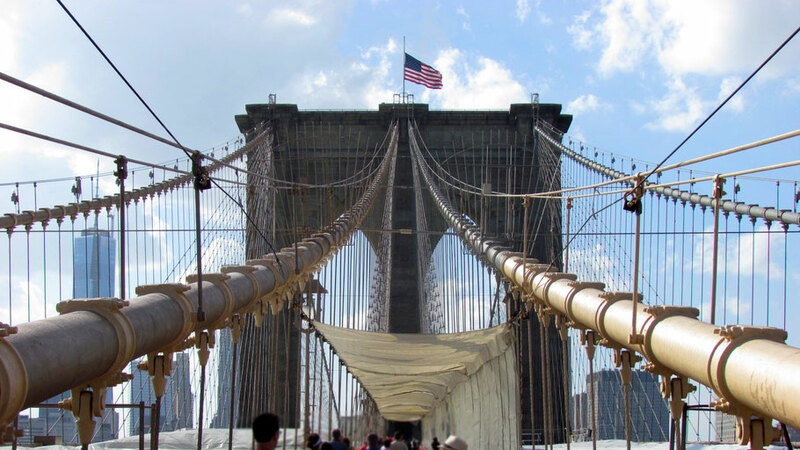 After that you can take a ferry over to Dumbo and walk over the Brooklyn Bridge back to Manhattan.